Studio recording of episode five of the The Dead Planet (a.k.a. The Daleks) had taken place on 20th December 1963. The public’s curiosity was piqued the following day when episode one was broadcast and at the climax, Barbara was menaced by an alien appendage. 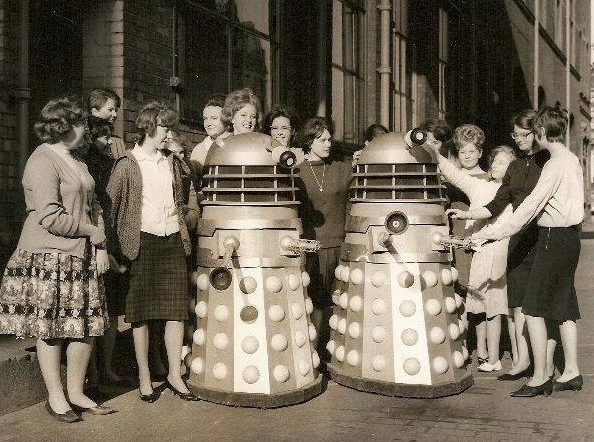 Two days after the glimpse of that sucker-arm, on 23rd December the Daleks’ first publicity was arranged, and a photocall took place featuring Dalek One and Dalek Two around Shepherd’s Bush1. They were pictured holding cabbages, confusing children in prams, and attempting to ride the bus to Hayes End, all the while observed by confused onlookers who had yet to see these creatures on television. Whilst recording of Doctor Who took a break over the festive period, five days after their publicity stunt the Daleks hit the screen in full on BBC1 between Christmas and New Year. Their impact was immediate. The two props which had been out on the streets of London were back in studio the following week on 3rd January and their first TV adventure finished production on 10th January. 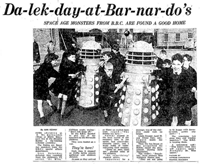 All this violence towards the Daleks took place in the final installment which was viewed by a television audience of 10.4 million on 1st February 1964 – and increase of 3.5 million people since the story began. The Daleks were considered a huge creative success and their role in lifting the profile of the series was extremely important. Dalek Four (left) and Dalek Two arrive at Barnardo’s in Stepney Causeway. Picture – Jacqueline Beston. Click for a larger view. Following the completion of the serial the four props were no longer needed, however Verity Lambert instructed two props to be retained in storage for potential future use. The props which were kept by the BBC were Dalek One and Dalek Three. 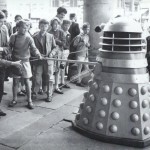 Verity Lambert then gave clearance for Dalek Two and Dalek Four to be donated to the Dr Barnardo’s children’s charity. The props delivered to their HQ at Stepney Causeway in early February.3 The donation was picked up by the newspapers and and the excited staff posed for pictures. The Daleks didn’t stop at Stepney for long though and they were soon whisked away to the Barnardo’s home at Barkingside, Ilford. This was covered by the Daily Express on 5th February and in a Blue Peter feature on 10th February 1964, a week and a half after the story’s final episode had been transmitted. Children from the home posed with their new acquisition for a number of photos as the media interest in these strange aliens began. The props quickly travelled around a number of the Barnardo’s homes including the Warlies School in Essex. The busy schedule would take its toll and already at this stage the props were succumbing to further damage, as Dalek Four had a strip of veneer torn off its gunbox, and a large chip had been taken out of the leading edge at the top of the skirt. Dalek Two lost both lights quite quickly and it too had veneer ripped off underneath the gunbox. For a while, the coating of underlay on the fender was still intact on both props. Anne Mullins and Dalek Three. Click for a larger view. Within a few of weeks of the donation, the decision by Doctor Who producers to let go of half their stock might have seemed a little hasty as they started to realise just how popular the Daleks were becoming. In April, schoolgirl Anne Mullins was looking for a star to open a fete in Fareham that she had organised. Instead of a star she came up with the idea of a Dalek and she quickly wrote to the BBC to see if they would oblige. After initially being turned down she explained that the fete was in aid of the British Empire Cancer Campaign and that was enough to make the BBC change their minds. Dalek Three was dispatched and the event became the first instance of a BBC Dalek attending a fete. Soon after discussions began on bringing the Daleks back to the screen for Doctor Who‘s second season. Children have Dalek rides at Gordon Fields in Ilford. Click for a larger view. 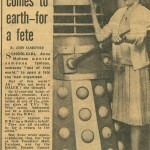 On Whit Monday, 18th May, another Dalek would make an appearance at a fete. The Romford and District Spastics Society joined forces with the Goodmayes Round Table and organised a money raising event at Gordon Fields in Ilford. With the news that the Dr. Barnardo’s charity had taken delivery of two Daleks, arrangements were made for one of them to appear at the event. 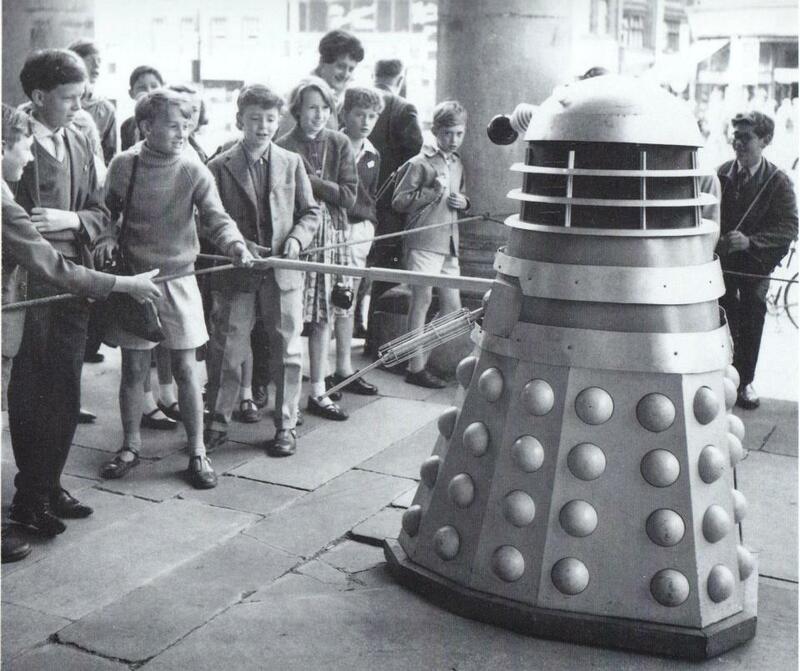 Dalek Four was the prop chosen and children were allowed to ride inside for sixpence a time. Carole Ann Ford and Christopher Trace and Valerie Singleton of Blue Peter fame also attended to sign autographs amongst various other activities. The event was a huge success with over 3000 people attending and over £900 being raised for the organisers. 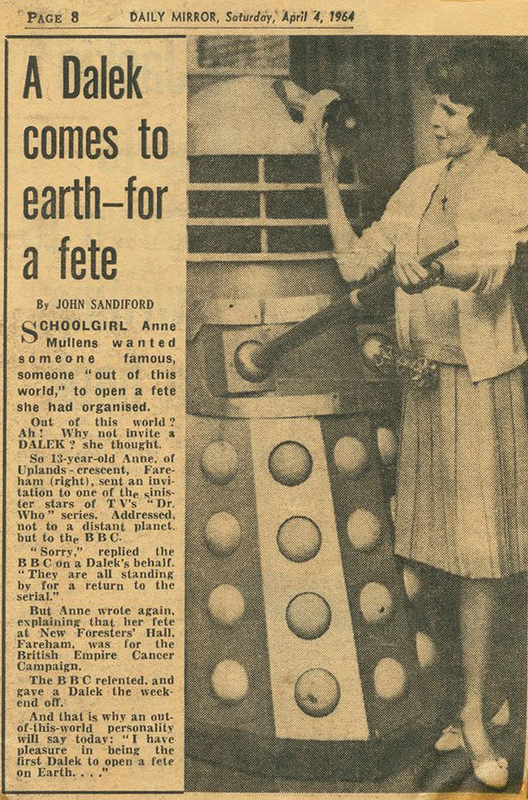 Three local newspapers covered the fete with the Dalek being described as “the main attraction of the afternoon” which highlighted just how popular they had become in a very short space of time. Dalek Three on the ‘Advance Electronics’ stand at Olympia. Click for a larger view. Dalek Three was out and about again in early June. Olympia was hosting the ‘Instruments, Electronics and Automation exhibition and the prop appeared on the stand of ‘Advance Electronics Ltd’ who were exhibiting at the show. 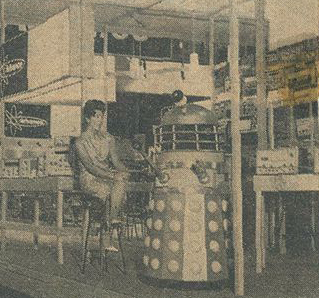 The company had supplied “futuristic instrumentation” for Doctor Who and in return they had use of the Dalek to give their display an extra added draw! 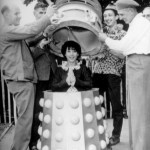 Carole Ann Ford in East Ham with Dalek Two. Click for a larger version. 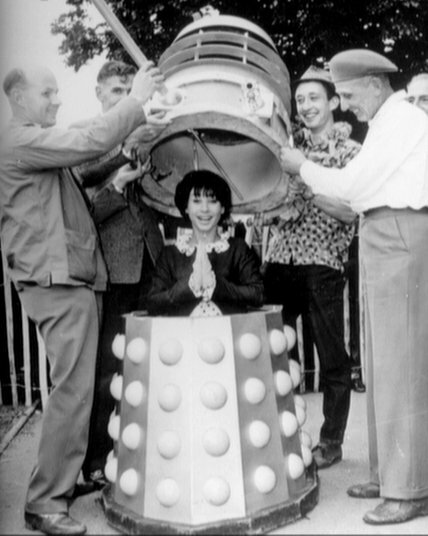 Just a few weeks after her appearance in Ilford, Carole Ann Ford was back in the area for another local event. The East Ham Town Show took place on the 20th June at Central Park and the event organisers expected some 30,000 people to attend! 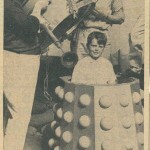 Appearing with Ford was Dalek Two, borrowed for the day from the nearby Ilford Barnardo’s home, and pictures were taken of Ford sat in the prop for the local press. The organisers had initially agreed to source one of the remaining BBC Daleks but a last minute hitch made this impossible. “Fortunately we managed to trace one of the two that had been presented to the Dr. Barnardo’s homes and the robot will be at the show on time” said John Kelley of the Borough Liaison Committee. 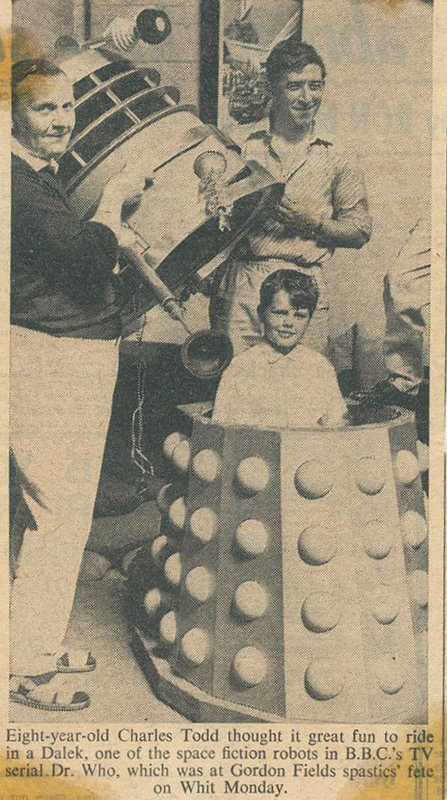 Dalek Four at the All Saints’ Church in Northampton, 4th July 1964. Click for a larger view. Six months after the BBC gifted the Daleks to Dr. Barnardo’s, plans were highly advanced for the return of Terry Nation’s creation. With the new storyline tackling the occupation of Earth by the Daleks, it required a large invasion force for the production. With the budget always tight on the show, talks began between the BBC and Dr Barnardo’s in Ilford to assess the state of the props and determine whether it was practical to temporarily repatriate Dalek Two and Dalek Four into into the Doctor Who family. At the time of these discussions, the Dalek props had been taken to a number of locations. The photo on the right was taken on 18th July 1964 and it shows Dalek Four in the central square at Orford Hill, Norwich.4 There were two Dr Barnardo’s homes in Norwich at the time, and this Dalek was on display next to Red Lion Street, a little over a mile away from Dr Barnardo’s Westwood Hostel on Newmarket Road. By the time this photo was taken, Dalek Four had had some repair work done to the gunboxes, however the damage to the arm-box veneer had got worse, a patch covering one screw had been torn off, taking the paint with it, and the lower collar had broken loose at the front. The prop was also missing its sucker attachments and the underlay on the fender had been removed. Various other marks show that the prop has seen a lot of use but it is still perhaps surprising that after six months at the hands of numerous children and adults, the prop is not more severely damaged. Dalek One can be identified by its uniquely thin lower collar, whilst Dalek Two has a distinctive smudge on the right-hand gunbox which is clearly visible throughout The Daleks. Dalek Three takes centre-stage for the main attack and it can be identified by its lack of lower collar screws. 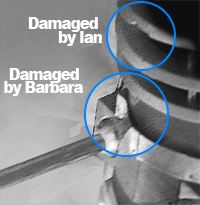 This prop is hit with projectiles from both Ian and Barbara before becoming one of the props which is tipped over backwards. 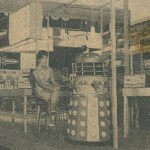 Dalek Two’s distinctive arm-box smudge can be seen in the Barnardo’s publicity photo above. As for the other prop, we can be certain it is Dalek Four by a process of elimination. By examining a different Barnardo’s photo which shows a Dalek hinged open, we can be certain of the following: It is not Dalek Two (no smudge). It is not Dalek Three (it has lower collar screws). It is not Dalek One (it does not have a thin lower collar). Therefore it can only be Dalek Four. There is an inch-wide strip of veneer torn off underneath the armbox. The Dalek photographed in Norwich has a normal width lower collar (so can’t be Dalek One) and it has its collar screws (so can’t be Dalek Three). 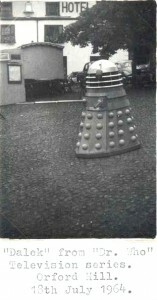 We know for certain which two Daleks were given to Barnardo’s, and we know both the date of the photograph and the date upon which the props were returned to the BBC, so we can therefore be certain that this is one of the Barnardo’s Daleks at a time before they were returned to the BBC. Furthermore, since this prop has the veneer arm-box damage mentioned in citation 3, we therefore know for certain this is not Dalek Two.